Why should I register with USA ESA as opposed to another service? Over 100,000 people have trusted USA ESA and USA Service Dogs (our sister site for service dogs) over many years with their service dog or emotional support animal registrations and we enjoy a 98% satisfaction rating across 10,000 reviews. As a result, our ID cards and identifying vests, leashes, and tags are easily recognized, helping you to quickly eliminate hassle and questioning when bringing your service dog or emotional support animal with you in public. Additionally, our ID cards are laminated and come with free plastic holders, so they won't fade and can easily last the lifetime of your service dog. 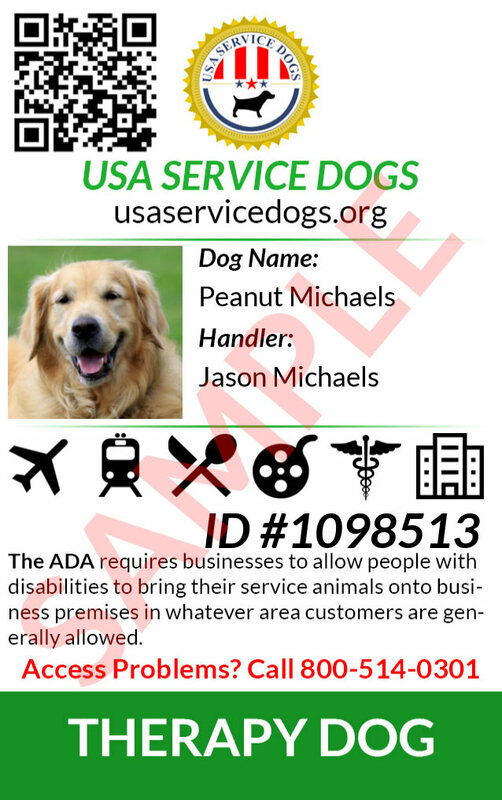 They're also double sided, containing your service dog / ESA ID on the front, and the relevant federal laws regarding service dogs or emotional support animals on the back, allowing you to quickly show the rules to anyone who asks. Furthermore, should you ever have an issue verifying your registration, you can rest assured that our friendly support staff is available to help you by phone or email no matter the time of day or night - 24/7/365 service. You don't get a 98% customer satisfaction rating unless you're relentless about resolving any issues that may arise for all your customers! And, if you're in a rush, you're in good hands, because all our orders ship next mail day (including Saturdays), and we have rush shipping options available on all orders. Standard shipping is always free! Do you need documentation of my disability before processing my registration? No, we do not need to see documentation of your disability to process your registration. We ask you to acknowledge that you have a disability that qualifies you for a service dog or emotional support animal under the interpretation of the ADA, ACAA, and FHA. Please do not take advantage of this powerful service. What's the difference between a service dog, emotional support dog, and therapy dog? Which is right for me? Service dogs must be trained to perform a specific task, however the law allows for owners to train their own dogs. Disabilities requiring service dogs typically include (partial list): mobility problems, blindness, paralysis, epilepsy panic attacks, deafness, speech problems, and PTSD. Emotional support dogs are not required to be trained to perform a specific task. They are simply there for companionship, affection, and to provide comfort to their owner. Common conditions requiring emotional support dogs include (partial list): anxiety disorders, panic attacks, stress, social phobia, PTSD, and chronic depression. Therapy dogs are not trained in any specific task and usually serve to give companionship to patients in a hospital, nursing home, or other palliative care environment. Therapy dogs are not afforded the same protections under the ADA as service dogs and emotional support dogs so you may not be able to bring them with you to all public places. How quickly will I receive my documentation after registering? We process all orders within 1 business day and offer express shipping options. Electronic registrations with printable ID cards are usually sent within 5 minutes of registering. We ship USPS to all 50 states. We use first class mail, priority mail, and priority mail express which is the USPS's fastest shipping service with guaranteed next business day delivery. Will my airline allow me to bring my animal with me into the cabin of the flight? How do I let others verify the registration status of my service dog or emotional support dog? Others may look up the registration status of your service dog simply by entering the ID on the certificate or ID card of your service dog into our lookup form at USA Service Dogs ID Lookup. What happens if a business mistreats me and I feel I am being discriminated against because of my disability? The first step in such an unfortunate situation is to stay calm and know your rights. Under the ADA, you are allowed to have your service animal or emotional support animal accompany you to public establishments even if the estagblishment has posted a NO PETS ALLOWED sign. You should explain to the owner or manager that the ADA entitles you as a person with a disability to bring your dog with you to public establishments. Usually, it is just a matter of ignorance on the part of the manager and the situation is quickly resolved. If not, the next step may be to contact the police since they can explain to the manager what laws are protecting you and your service animal or emotional support animal. (Please note however that some states may have enacted legislation that may restrict some of your rights as a person with a disablity to bring your service animal to public establishments - check with your local state laws). If you are trying to effect change for a certain establishment, it may be necessary to contact a lawyer who can lobby on your behalf, however usually drafting a letter to the owner is enough to convince them to change their policies. Emotional Support Animals are not specifically mentioned by the ADA and so businesses (besides airlines and housing establishments) have more discretion about whether to allow the ESA onto its premises. In general, kindly asking the business owner to allow entry with your ESA, along with presenting the proper paperwork, including a therapist letter, will be enough to allay any concerns the business owner may have, so long as your ESA is well-behaved. How long is the registration good for? 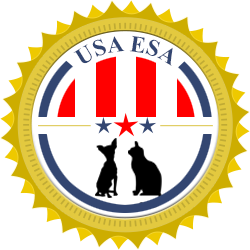 At USA ESA, your registration is good for the life of your emotional support animal. How quickly can I expect to get my electronic printable ID cards? Can I display my electronic ID card on my cell phone instead of printing it out? Yes! If you don't have a printer available, it's possible to simply open the electronic ID card you receive after placing your order and display it to whoever is asking for it. Bear in mind that some people would prefer to see a physical, instead of electronic ID card. Where can I find more information about the ADA as it relates to service animals and emotional support dogs? Please also keep in mind that registration is not required by the ADA. There is no official government database of service dog registrations and each service maintains its own independent database. Many people do however find that having ID cards, certificates, vests, tags, etc. make their lives much easier by helping to avoid hassle with many places of business where people wish to bring their service dogs and emotional support animals. What kind of training and tests will my dog need to become certified as a service dog? Service dogs are required to be trained in certain tasks to assist the owner as well as obedience, manners, and public skills. Under the law, you are allowed to train your own dog to be a service dog. No training certification is required to register your service dog at USAServiceDogs.org and receive a service dog registration kit however we ask that you be honest about your dog's abilities. Am I eligible to have a service dog? We do not require medical documentation or a doctor's note to process your registration. We ask that you use this service responsibly. Individuals with physical or mental disabilities that impairs their ability to complete basic life activities are entitled to a service dog who can assist them in life's basic tasks. Under the American with Disabilities Act, individuals with service dogs do not have to disclose the nature of their disability to anyone in order to be allowed to have the service dog accompany him or her wherever they go. No one is allowed to ask for medical documentation, special ID cards, or proof of training of the animal of any kind. Do I need a doctor's note or medical documentation? No, you do not need a doctor's note or medical documentation to bring a service dog with you to any facility. What fees are associated with having a service dog? Businesses are not allowed to charge you extra fees to allow you to bring your service dog into their business, including airlines. 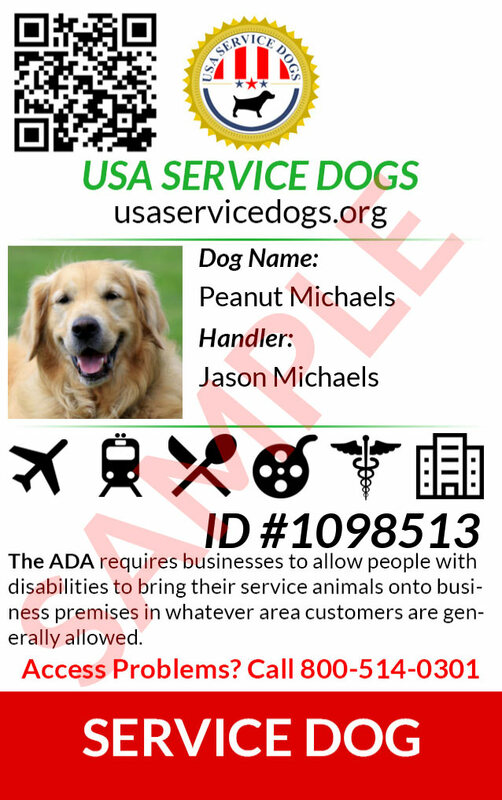 If a business tries charging you extra for having a service dog, please direct them to the text of the Americans with Disabilities Act, available here. What if others are allergic to my service dog or ask me to leave it outside? Allergies or other problems such as fear of dogs are not valid reasons for businesses to deny entry to you and your service dog. However, if your dog misbehaves and is not housebroken, businesses may ask you to leave your service dog outside, but are required to still provide you with service. Must my service dog be on a leash? In general yes, however if the leash impedes the ability of the service dog to complete a specific task, the leash may be removed. What do your Service Dog ID cards look like? Am I eligible to have an emotional support animal? What documentation do I need to send you? For privacy reasons and HIPAA compliance concerns, we do not need to see documentation and/or medical regarding your medical condition in order to process your emotional support animal registration. We ask that you use this service responsibly and advise you to carry a medical note with you at all times as businesses and public places have a right to see a note from your doctor about your need for an emotional support animal. I do not have or cannot obtain an ESA prescription letter. What should I do? If you need an ESA prescription but cannot obtain one, we do have licensed therapists we work with who can provide an ESA evaluation over the phone and issue an ESA letter to you should that be deemed appropriate. Please click here for more information or to order this service. What medical conditions typically qualify someone to have an emotional support animal? Emotional support animals can help with a wide variety of medical conditions, including anxiety disorders, depression, bipolar disorder, sleep disorders, arthritis ataxia, neurocognitive disorders, post traumatic stress disorder, various fears and phobias, vision and hearing disabilities, multiple sclerosis, epilepsy, autism, and more. What kind of dog can be an emotional support dog? Any animal, and any dog breed can be an emotional support animal. There is no minimum or maximum size specified in laws related to emotional support dogs. Can a business force me to leave with my emotional support dog? Only in certain specific cases can a business force you to leave the establishment with your emotional support dog. If your dog is misbehaving, barking loudly, relieving himself in the establishment, or otherwise causing a problem, the establishment is within their right to ask you to leave with your dog. Since ESAs are not governed specifically by the ADA, businesses outside of airlines and housing establishments can use their discretion with regards to whether to grant access to your ESA onto business premises. However, the vast majority of business owners have no problem allowing a well behaved ESA onto the premises when presented with a valid ESA letter explaining the need for the ESA. What do your Emotional Support Dog ID cards look like? Am I eligible to register a Therapy dog? Anyone may register a therapy dog for any reason. What rights am I entitled to with a therapy dog? Typically, therapy dog registration is reserved for situations where you wish to allow your dog entry into hospital and palliative care settings. You may not be able to take your therapy dog with you to all public establishments including airplane cabins. For these situations, we recommend registering an Emotional Support Dog or Service Dog depending on your situation. What do your Therapy Dog ID cards look like?